Add turmeric, chilly powder , coriander powder and curry leaves to the roasted coconut, stir and roast for 2 minutes. Remove from stove and let it to cool. Grind the ingredients to a smooth paste with little water. Heat oil in a pan .Saute ginger , garlic, green chilly and onion. Brown the onions to golden brown in colour. Add garam masala, perumjeerakam ,crushed pepper and salt. Add ground masala and cook for few seconds. Add mushroom into it .Cook well on low heat till the oil comes out . Add coconut milk into and strill well.Switch of the stove. Heat Oil in a pan and splutter mustard seeds,red chilly and curry leaves . Pour this into the mushroom curry. Yummy Mushroom curry is Ready! I liked the mushroom curry.it will take around 1-1.5 hrs to prepare.if anybody likes vartharacha curry then u can try this.Good luck my dear. 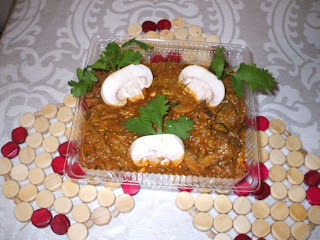 Good One!I know varutharcha curries but never tried on mushroom...Will try this one soon! hi kitchenfairy,try this and lemme know the result..